Today we’re launching some brand new equipment data, looking at the mass spectrometer market and highlighting the companies that are doing best. CiteAb product manager Rebecca Sadler has been putting this data together so we’re going to have a chat with her about the trends it shows. Rebecca, can you give us a bit of an overview about this new data? This new dataset covers 140 mass spectrometer machines to date, from nine suppliers. Our team has collated over 17,000 citations from academic literature. Citations come from institutions across 109 countries. So which machines are doing particularly well right now? 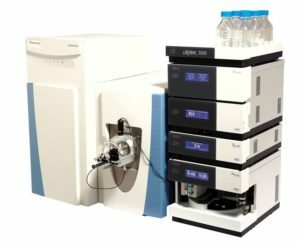 The top cited instrument according to our data is the Q Exactive Hybrid Quadrupole-Orbitrap Mass Spectrometer from Invitrogen – a subsidiary of Thermo Fisher. Which companies are leading in this market? Invitrogen is out in the front at the moment, with two machines in the top five and almost half of the total market share. We’re also seeing Bruker, Waters, and SCIEX doing well. What does the data tell us about trends in this market? Invitrogen’s share of the mass spectrometer market has been growing year on year since 2010. The company holds 46 per cent of the total citation share from 2010 until today, although if we were to separate out the data from 2016 onwards this figure shoots up to beyond 50 per cent. Our data shows a gradual decrease in citation share for both Bruker and Waters over the years, as they lose market to Thermo’s Invitrogen. How does the mass spectrometer market compare to markets for other instruments? We’re already seeing a lot of differences compared with the flow cytometer market. There is a much larger range of instruments available, although we have found there are fewer citations. The data suggests this is a niche market yet still very competitive and valuable. There also isn’t one specific company with a large lead in the market (for example, BD Bioscience holds over 90 per cent of the market in flow cytometers whereas Thermo’s Invitrogen holds 46 per cent of the mass spectrometer market) so it will be interesting to continue digging into this data and looking at some trends in the same way as we have over the last year for flow cytometers. What changes to the equipment is happening to drive this market? Well there is a broad range of mass spectrometer machines, giving a huge amount of choice for researchers. Machines have been improving in sensitivity, allowing identification of samples with lower abundance, with each new machine released allowing higher and higher levels of confidence in the data. Today we’re giving away the data for the top five cited mass spectrometer instruments for free – sign up below to have yours delivered direct to your inbox. Keep an eye on our blog over the coming months for further updates about this new data and more insights from Rebecca into the mass spectrometer market.